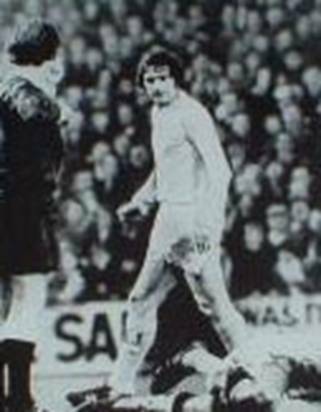 Date: Wednesday, 9th April 1975. 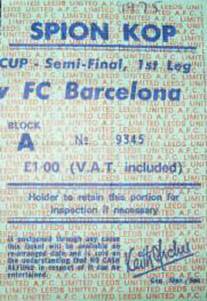 Competition: European Cup Semi-Final First Leg. 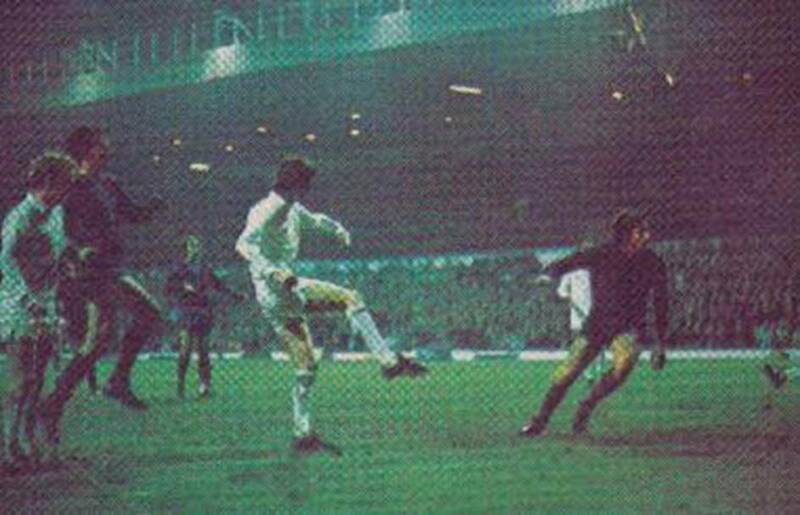 Scorers: Leeds United: Bremner, Clarke. Barcelona: Asensi. 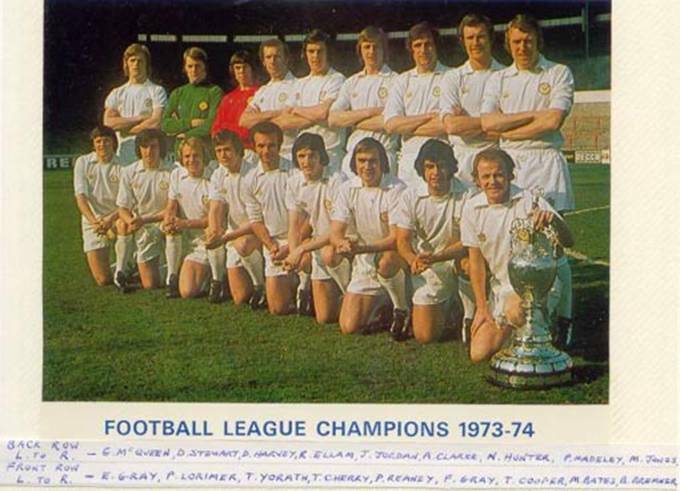 Leeds United: Stewart; Reaney, F.Gray; Bremner, McQueen, Madeley; Yorath, Clarke, Jordan, Giles, E.Gray. 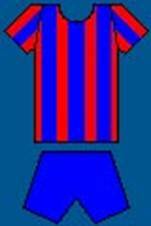 Barcelona: Sadurni; Costas (Rife), Marinho; Gallego, De La Cruz, Neeskens (Juan Carlos); Rexach, Migueli, Cruyff, Asensi, Heredi. 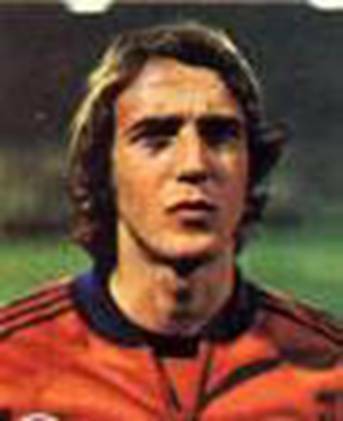 United had received the toughest draw possible in the Semi-Finals of the European Cup when they were paired with Spanish giants Barcelona, who included in their ranks one of football’s all time greats, Johan Cruyff, and his Dutch midfield partner Johann Neeskens. In the other half of the draw the German power-house Bayern Munich, were up against French club St Etienne. 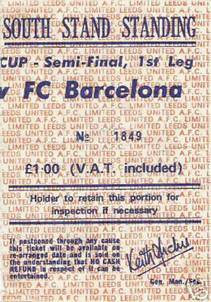 Elland Road was rocking as United beat mighty Barcelona to inch ever closer to their first European Cup Final. They deservedly beat the big-spending Catalan outfit 2-1 thanks to a late Allan Claeke winner. 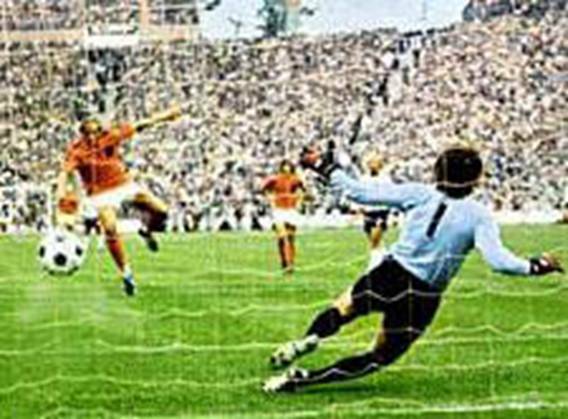 Jimmy Armfield had chosen to leave out Norman Hunter and Peter Lorimer, so that Paul Madeley could man-mark Johan Cruyff and Terry Yorath could provide the extra defensive cover, as a ploy to keep the Holland midfield quiet. 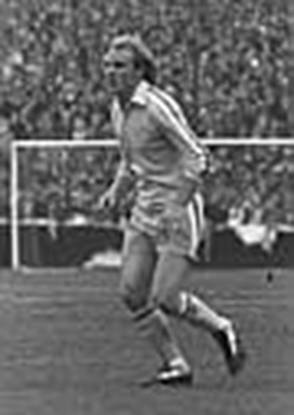 He had also chosen to leave out Trevor Cherry in favour of Frank Gray and leave out the mercurial Duncan McKenzie, although the former Nottingham Forest striker was available once more having served his suspension for being sent off in Budapest. 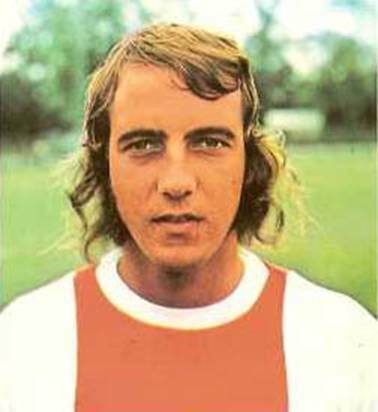 Barcelona were built around Dutch super-star Johan Cruyff, who had already inspired Ajax Amsterdam to three successive European crowns from 1971. 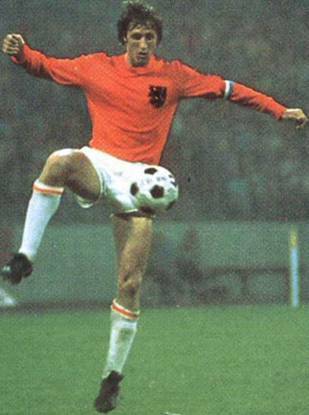 Three times ‘European Footballer of the Year’ the midfield genius had moved to Barcelona for a world record £922,000 in 1973, the year after he had captained Holland in th World Cup Final defeat against Germany. 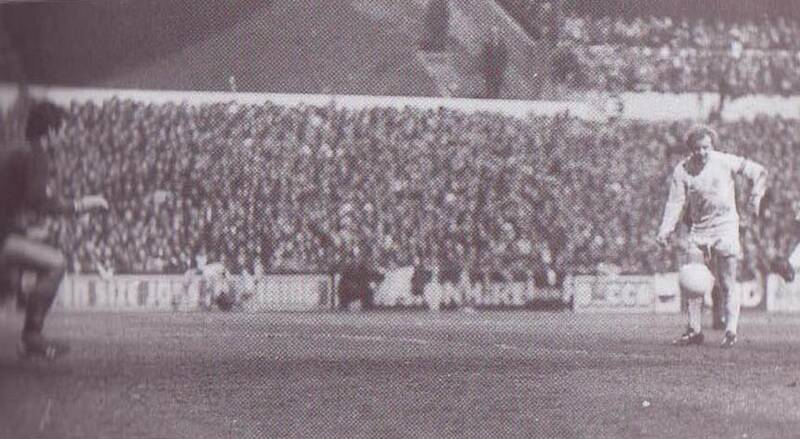 It was the biggest game in United’s history and there was little wonder the club banked record receipts of £90,000 for the game. 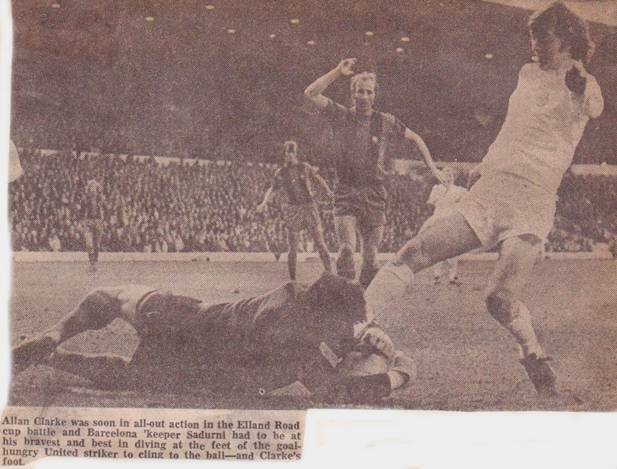 Dutch masters Johann Cruyff and Johann Neeskens were brought down to earth at a packed Elland Road as United edged closer to their first European Cup Final. 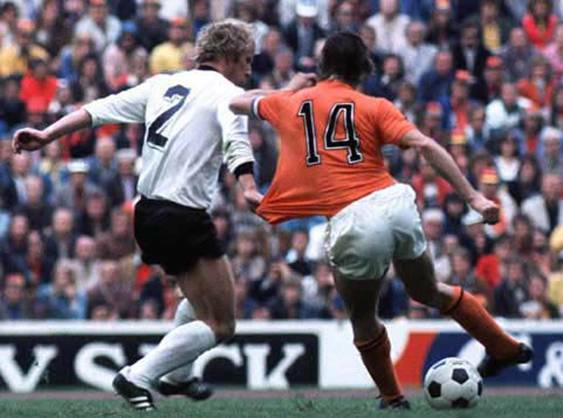 The pair had played in Holland’s World Cup Final side beaten 2-1 by West Germany the previous year and were regarded among the best midfield players on the planet. 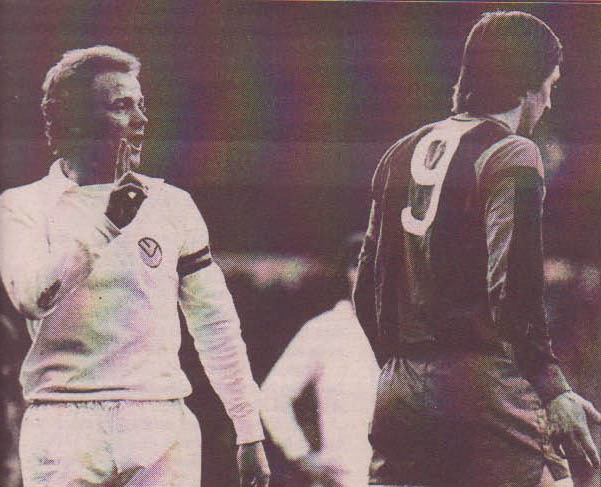 But it was Scottish skipper Billy Bremner and his partner Johnny Giles who controlled the nerve-tingling match, United’s sixtieth game of the season. 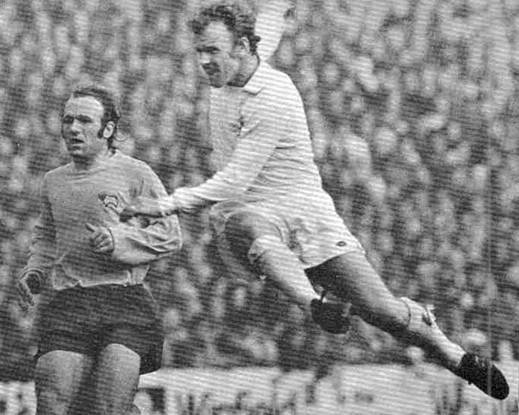 It was Billy Bremner who gave Leeds a dream start with a goal after only nine minutes. 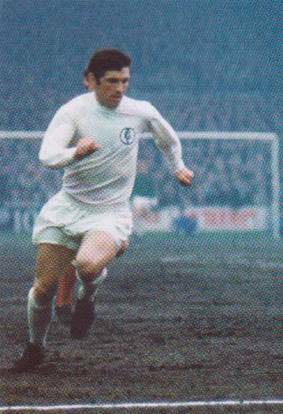 Johnny Giles played the ball up to Joe Jordan, whose header found Billy Bremner in space. 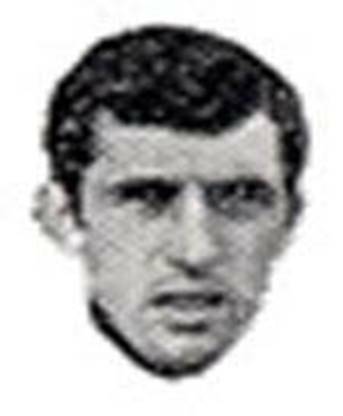 He took a few strides forward before driving the ball past Salvador Sadurni with an angled shot to become the first player to score against the Spanish side in the competition that season. 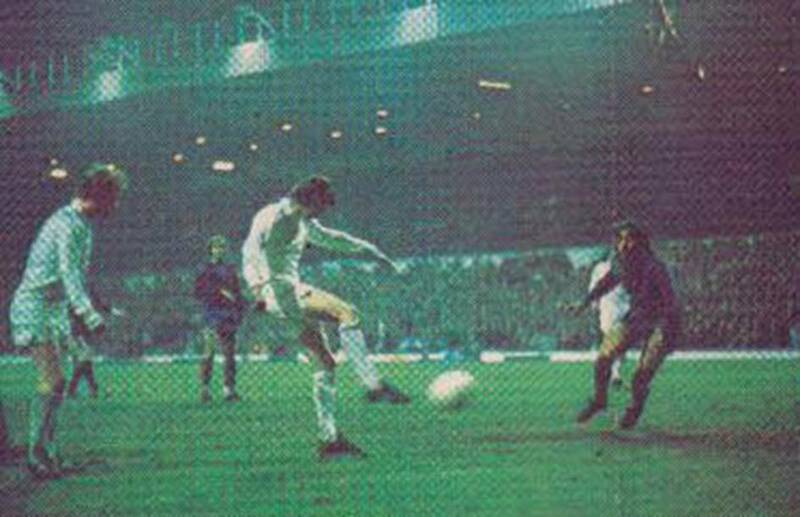 Leeds knew they would probably need a two goal lead to take to the vast Nou Camp Stadium and headers by Allan Clarke and Gordon McQueen went close to giving them that cushion. 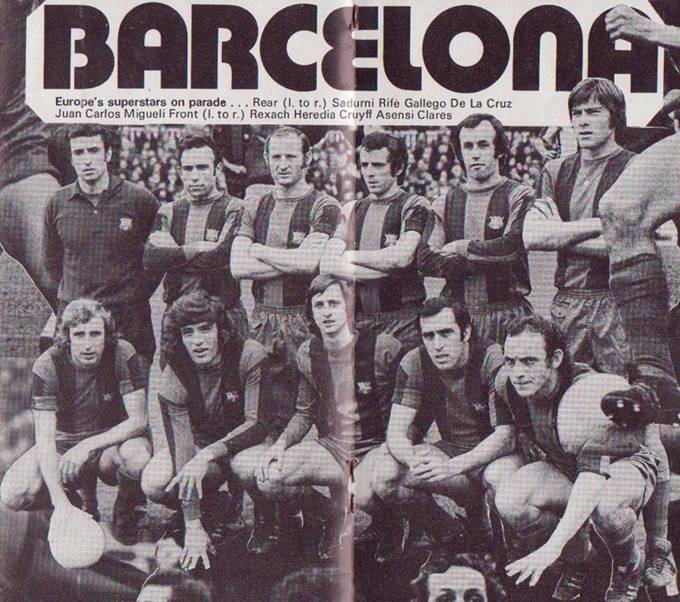 Despite falling a goal behind so early, the Catalan side continued to concentrate on defence with Johan Cruyff helping out when needed at the back. 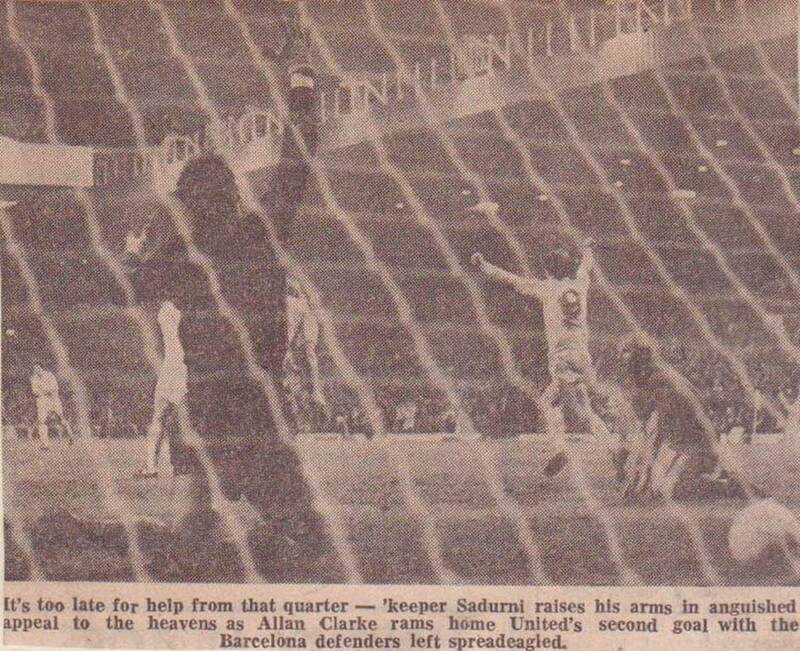 Yet even though with all the left-wing promptings of Eddie Gray, who gave Jesus De La Cruz an uncomfortable evening, United found chances hard to come by against a defence in which Brazilian star Mario Marinho excelled. However, it took a superb one-handed save from Salvador Sadurni to keep out a fierce Joe Jordan shot just before half-time. 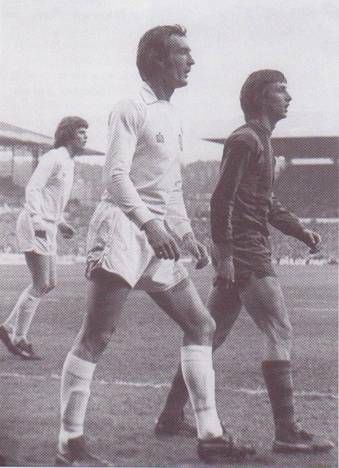 With Paul Madeley keeping Johan Cruyff quiet, the Spaniards were largely on the defensive but did produce some dangerous counter-attacks. 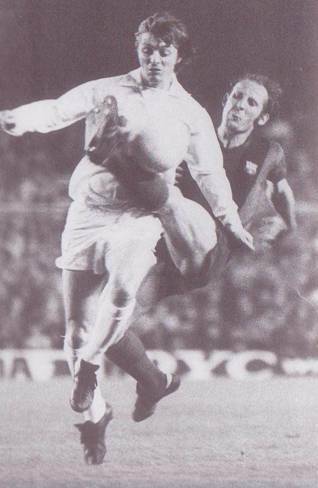 Johan Cruyff, when he did on occasions get into advanced positions, was always a threat and was at the heart of the move that brought Barca their surprise equaliser. 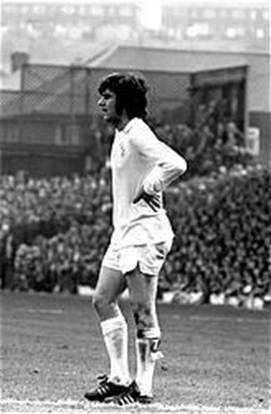 In the sixty-sixth minute the Dutch Master slid the ball through to Juan Carlos Heredia, who was checked on the edge of the area by Paul Reaney, although Leeds were unhappy about the award of the free-kick against their full-back. 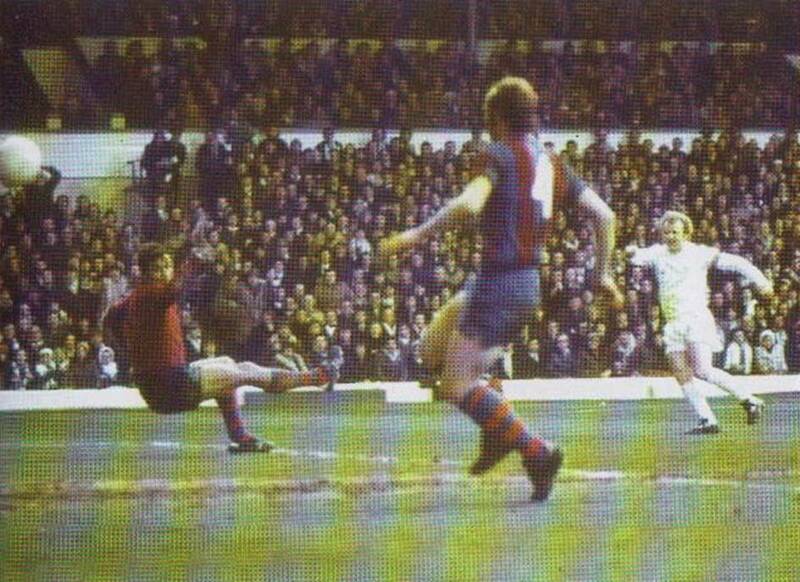 Cruyff stood over the ball, bided his time and rolled it sideways for Juan Manuel Asensi to crack his shot unerringly past David Stewart. For United, who had looked like winners for much of the match, it was a hammer blow and it looked as if they were losing their grip of the game and in danger of actually losing, but they regained their composure and steeled themselves for a grandstand finish. With twelve minutes remaining they regained the lead. 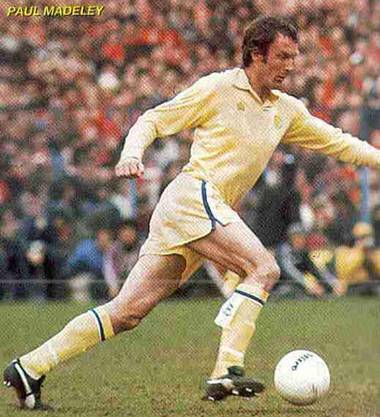 Paul Madeley’s pass released Paul Reaney, who surged down the right wing and crossed for Joe Jordan to head down in the box where Allan Clarke, six yards out, lashed in his twenty-first goal of the season. United pushed hard for a third goal but with Barcelona killing time at every opportunity, they had to settle for a 2-1 lead to take to Spain. Barcelona were happy to have gained an away goal, but United were just as happy to have secured a lead to go into the second leg with. 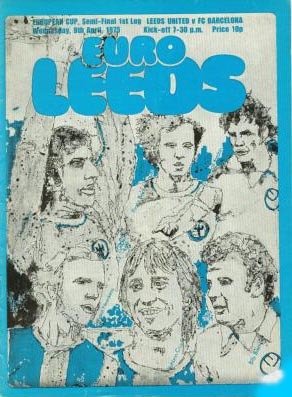 Elland Road was a cockpit of noise and it was hard to imagine such scenes were possible given the disastrous start to the season.